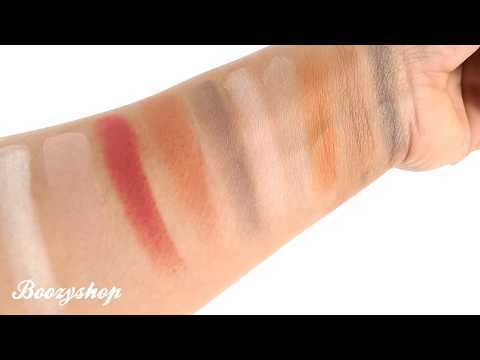 Barry M Eyeshadow Palette Fall in Love is an eyeshadow palette with beautiful warm and cool tones. This palette contains 10 different shades with matte finish. With this palette you create the perfect look for both day and evening. Use the beautiful soft tones for a natural look or choose the darker tones and create a nice smokey eye. The formula blend super easy, wears comfortably on the skin and is long lasting, so you can enjoy your look for an extra long time. Contains 10 warme and cool tones. First start by applying a good eyeshadow primer. Apply the desired shades with an eyeshadow brush. Talc, Mica, Magnesium Stearate, Dimethicone, Ethylhexyl Palmitate, Polyisobutene, Synthetic Wax, Phenoxyethanol, Paraffinum Liquidum, Ethylhexylglycerin, [+/- Ci 77891, Ci 77492, Ci 77491, Ci 77499, Tin Oxide, Synthetic Fluorphlogopite].